With the United Nations setting the 2030 Agenda for Sustainable Development and with the 2020 Tokyo Olympic and Paralympic Games closely approaching, interest in sustainability has been increasing. Central and local governments are asked to consider sustainability in their procurement practices, which has led to more international attention on sustainable public procurement (SPP). In Japan, public awareness on SPP slowly spreads under the context of implementation of SDGs and Tokyo 2020 Sustainable Sourcing Code, etc., but some activities for analyzing the status quo and further studies for SPP are still emerging. This report only shows summaries of our questionnaire survey results on SPP for Japanese municipalities, and provide simple analysis on the status quo regarding the public procurement and local sustainability in Japan. CSO Network Japan will implement further analysis on these data and make some recommendations to promote SPP in Japan. Your comments on this repot would be very beneficial. * Designated cities are cities with a population greater than 500,000 that are designated by government regulations, bunder the Local Autonomy Law. 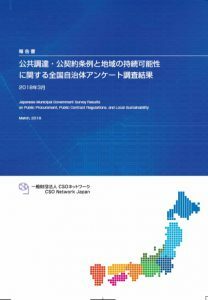 At the time of this report, there are 20 designated cities in Japan.